February 22, 2016 - "Company News"
Gopher Resource recycles lead-bearing scrap materials, such as lead-acid batteries, into elemental lead or lead alloys. The EPA’s 2008 nationwide regulation required that large industrial sources of lead emissions, such as smelters, lower their emissions from the current standard of 1.5 micrograms per cubic meter (based on a quarterly average) to 0.15 micrograms per cubic meter (based on a rolling 3-month average) by the year 2016. These more stringent Air Quality Standards required that the Minnesota Pollution Control Agency provide initial notification to the EPA in October 2009 on whether any facilities in Minnesota would not meet the new limit. 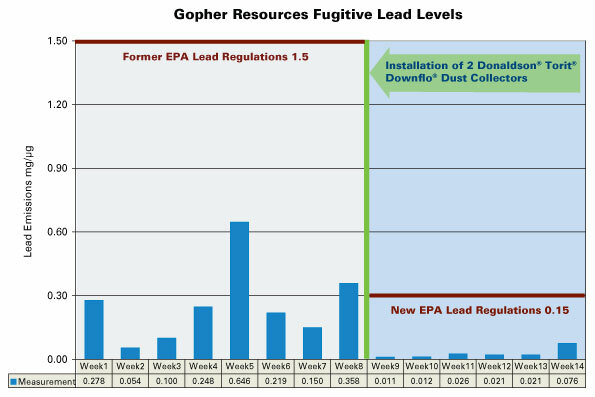 In anticipation of the new limit, Gopher Resource decided to be proactive and “get ahead of the curve.” Early in 2009, a study of fugitive dust sources was conducted, which identified the material transfer room (a structure built after the original Torit collector installation in 1993) as its most significant emissions source. In addition, fugitives escaping the blast furnace enclosure and the afterburner structure were identified as potentially contributing to the ambient lead levels surrounding the facility. It was determined that two additional banks of customized DFT 4-144 collectors were required to meet the new EPA standard. The chart below illustrates emissions levels before and after the August 2009 installation of these collectors. Stephen Yates, Gopher’s EHS Manager, was impressed with the results. He stated, “Looking at the data once the two new Torit systems were installed, the numbers are consistently running much lower than previous months. Assuming this continues, we’ll have no problem meeting the new 0.15 µg/m3 rolling 3-month limit.” These results allow Gopher to lead the way in meeting and exceeding current environmental standards.